On Tuesday, May 31, 2011 our ship sailed slowly into Budapest, Hungary, in the early morning. This city is the capital of Hungary, which was under communist rule until the late 1980's. The first settlement of this area dates back to the 1st century AD, built by the Celts. The Romans occupied the area for several centuries, and changed control over the centuries. Buda is on one side of the Danube, and Pest on the other. Once separate cities and fortresses, they are now combined into one. The country is largely Roman Catholic. I happened to wake up and open our black-out curtains just as we passed the Parliament Building high on the hill. What a sight! The old castle city and cathedral is just next to it. Our shipped docked close to the access point for the center of town. Unfortunately, not long after another ship pulled up next to ours and docked tandem to ours -- that blocked our view of the hilltop sites during the day. Our bus/walking tour of Budapest began at 8:30 a.m. The weather was lovely - no rain, clear skies, about mid-70's. Budapest was heavily damaged during WWII by American and British air raids and later during the battle between Russians and Hungarians against the Nazi occupation. After the war, the country was under Communist control, until 1989. This city is now significantly rebuilt and the architecture shows the new (some with the very boxy communist architecture) with the older more Baroque and neo-Gothic architecture. The bus ride took us up the main street and to the monument for the prior rulers of Hungary. Across from this big square was the museum, and behind it a thermal springs spa that looked like a palace - one of the many spas built in this area during Turkish occupation of Hungary. Much of the monument to the rulers of Hungary was damaged during the war, and many of the statues have been rebuilt. We then drove to the other side of the river and up to the former castle city up on the hill, opposite our ship. The Matthias Church, built around 1015 AD, sits atop this high hill and can be seen from the other side of the river. We did not go into the church, which was currently under renovation - it's roof is COVERED with magnificent colored glass tiles -- the link will take you to a page that shows an aerial view of the church. Our guide took us to the fortress walls, where we had time to look at the view, and walk past the very touristy souvenir shops. We stopped at a local market and bought some local paprika and goose liver pate (Mom's favorite!). Our bus dropped us off and we began a walking tour along the winding cobblestone walkways of the old market place and ended up in front of the opera house. To our right, a few hundred feet away stood the gray building housing the U.S. Embassy. Once again, we wandered around the various streets, looked in a few of the shops, and then walked back to the ship, where we ate lunch on the sky deck one last time. In the afternoon, Brian relaxed on the ship while I went for a 3 hour walk (yep, that's right -- I did it despite the hour or so of walking that morning!). 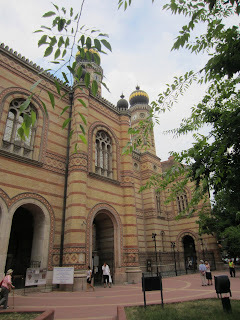 I first walked about 25 minutes to visit the Dohany Street Synagogue. Dohany Street was the border of the Jewish Ghetto during WWII. My walk to the synagogue was somewhat futile, because the building complex is now a museum, the entry charge was nearly $15 and I did not have Hungarian money, or enough Euros, on me. Hungary lost 20-40% of its Jewish population during WWII, and is currently home to the largest population of Jews in Europe. 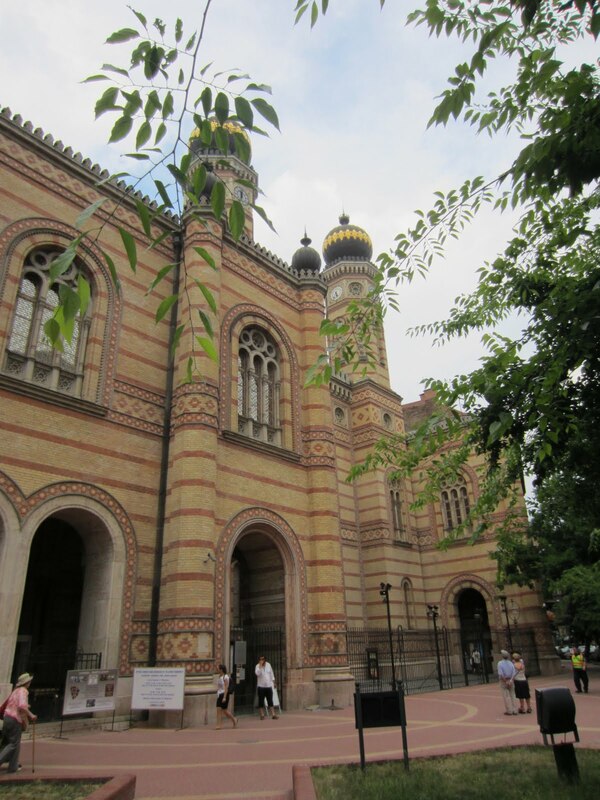 The synagogue is the largest in Europe and the 2nd largest working synagogue in the world. I walked along the outside of the building, past the graveyard behind the wrought iron walls, and peered at the many gravestones with dates of 1944-45, commemorating those who died during the war. 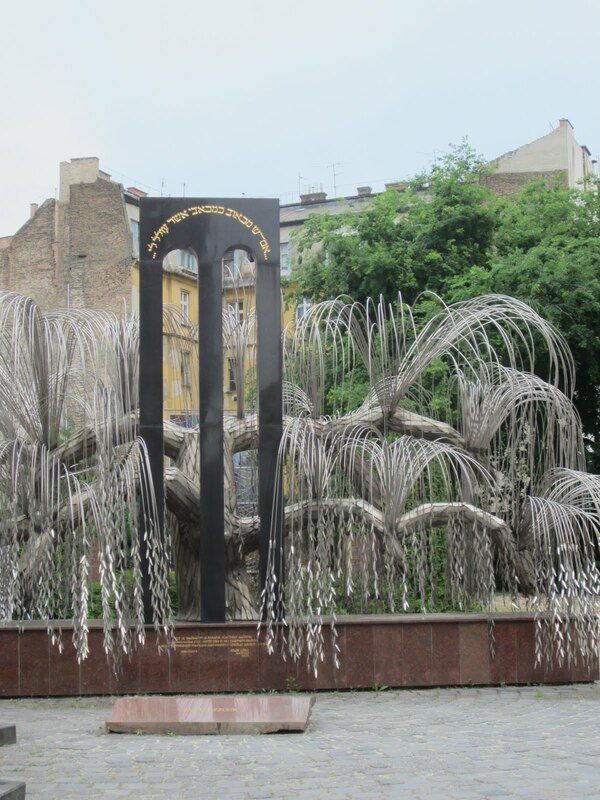 In the back of the synagogue I could see the memorial to Raoul Wallenburg, in commemoration of the nearly 400,000 Hungarian Jews who died in the war. This entire complex was restored following significant damage during the war -- the renovations, started in the 1990's after the communists left Hungary, was largely funded with a $5 million donation from Hungarian Jewish immigrant Estee Lauder. 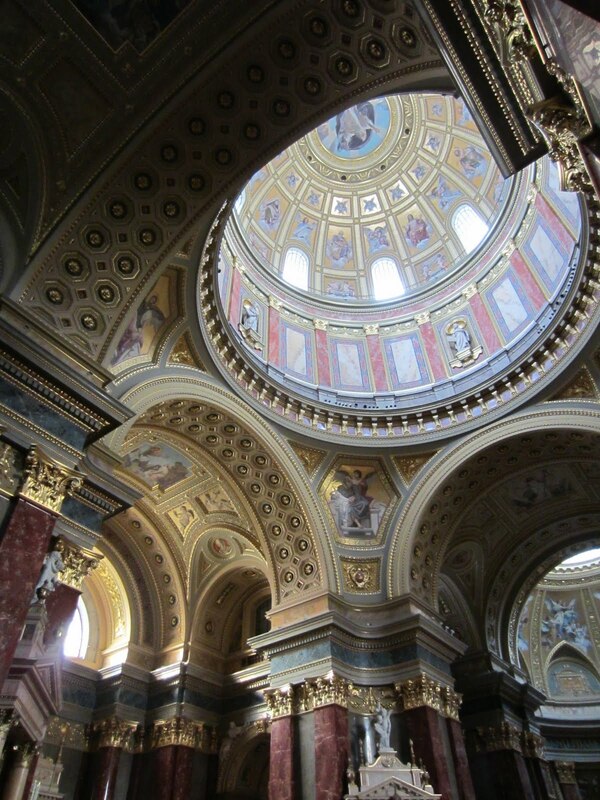 From there I walked through the winding streets to the other side of that large commercial area and visited the spectacular St. Stephen's Basilica. 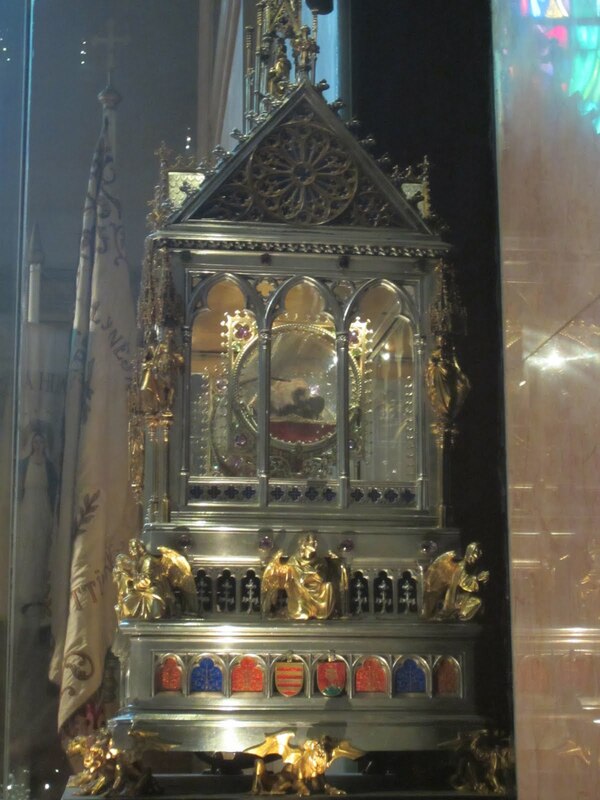 Behind the massive altar, in the vestry area, the mummified fist of Stephen, the first King of Hungary (975-1038) is kept in a small glass monument. The inside of this Basilica was beautifully restored and I could only imagine what the sound of that massive pipe organ would have been like had it been playing while I was there. 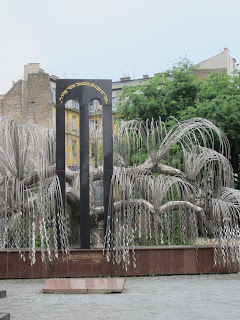 I then walked back to the river, and instead of returning to our ship, turned right and walked down toward the next bridge, to a monument established in 2005 as a memorial to the Jews who were shot along the river during WWII by the Arrow Cross brigade. The Shoes on the Danube Promenade is associated with those Jews that Raoul Wallenburg attempted to save during the 1944-45 time period. This was particularly poignant for me, remembering that we had driven along the Euphrates River just two years ago, where thousands of Armenians suffered similar fates. The monument along the river consisted of bronze shoes, of all shapes and sizes, facing the water. Only a few people where there, and I had time to reflect on what tragedy these people faced as a result of Hitler's maniacal plan to exterminate the Jews. Our last day on the Panorama ended with a spectacular display of lights. Although I stayed on the ship, Brian, and our Aussie friend Doug, walked across the bridge and along the river and took some spectacular night pictures. See Brian's photos (upper right corner of this blog). We packed our bags, and readied ourselves for an early disembarkation and trip to the airport the next morning - destination: Prague, Czech Republic! Time to bid farewell to Panorama.